In a recent post, I discussed my continental conundrum–how to teach the regions of the United States in an engaging manner, in a way that would not entail me talking at the students for hours on end, them taking notes, and completing redundant activities that require the simple absorption and regurgitation of seemingly useless information. What I needed was context, for no information is useless when learned with some relevant context. This context, or the ideas around the information, help to make it important and help us, as learners, encode the information efficiently. Instead of merely collecting dots, when we have context we are able to “connect the dots” much more easily. Luckily, I found my context, which I alluded to in my last post. However, I don’t think I knew quite what that context was yet. In it, I thought about looking at regions through immigration and the different people that came to America, but it dawned on me that it was not just the people that came to our country that would provide the context; rather, it was the building of a civilization and the construction of a culture that would provide the foundation for our study of the United States regions. Many kids are just as “smart” as we are; they simply don’t have the same amount of background knowledge. As I mentioned earlier, the last thing I wanted to do was create a series of monotonous lessons that took them through the history of the United States. Instead, I hoped they could experience it for themselves. I wanted them to create their own knowledge, partially because I want them to practice researching, but also because they need to see that they are just as “smart” as I am; they simply don’t yet have the background knowledge I do. But mostly, it is imperative they know that they are capable of teaching themselves. Immediately they started to work on research. 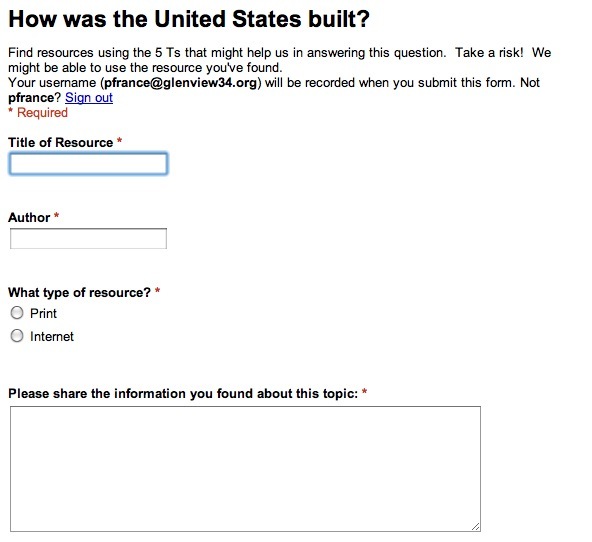 In order to provide some structure to the process, I had them input their facts into a Google Form, where they entered the name of the source, the author, the media (print/Internet), as well as the fact they found that helps to answer the question. Almost immediately, I was able to watch the Google Spreadsheet populate with their information. At the end of our process today, the kids had found over one-hundred facts that helped us answer this extremely complex and layered question. Oh, and did I mention that, in the process, the kids created a cart of books for me to bring back to the classroom, all about the creation of the America we know today? So we have all these facts. How do we provide the context? What’s great is that all of them have inserted facts into the spreadsheet, which means all of them will come to the table with some sort of background knowledge. At this point, the knowledge is still a bit decontextualized. They know these segmented facts, all relating to the same topic. Tomorrow, they will come in, and begin to build their own context. 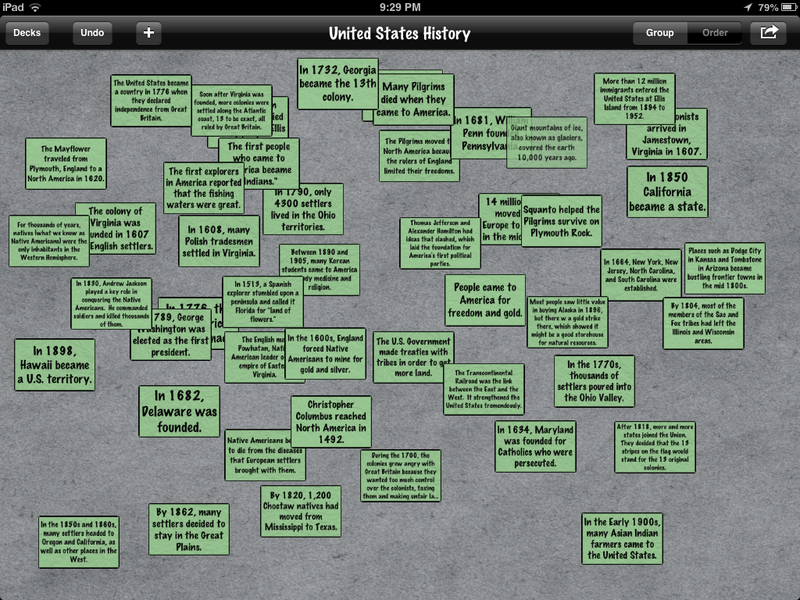 I’ve copied all of the facts into the iPad application, iCardSort, which makes movable cards that the students can group and order. Due to the fact that most of the cards have dates, the kids will be able to place the events in order, begin to see a progression of events that show the building of our country, and even ask questions for further research. This is, yet, another example of how making the research process concrete for them, not only makes them successful, but allows for the modeling of complex thinking tasks such as synthesizing information. I’m excited to see what conclusions they draw tomorrow from the cards and the questions that they come up with. More to come. Prev Is Gay Okay in School? Next Empowering Kids: A Continuation of "Teaching Kids to Teach Themselves"